Location: Ustra Hotel is situated in the beautiful town of Kardjali, very close to the Stadium and next to the Law Courts. Accommodation: The hotel offers 51 double rooms (39 twin and 12 double). All of them are equipped with direct telephone line, air condition, satellite TV with over 40 channels, mini-bar. Hotel Facilities: There is a lobby bar and restaurant at guests' disposal. 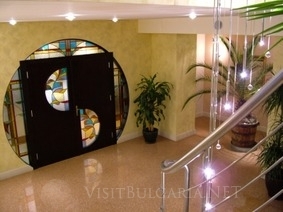 "Ustra" Restaurant offers traditional Bulgarian cuisine and a class selectioн of good wines and bevarages. The restaurant can seat upto 150 people indoors and 50 guests in the summer garden outdoors. Live music and karaoke available. Services: Hairdressers' Studio and Hair & Beauty Saloon at guests' disposal. Relax massages, Essential Oil Aromoteraphy procedures, cosmetic face treatments are offered. For the business travellers hotel Ustra offers a conference hall for 40 persons, equipped with flipchart, laptops, printer, TV and DVD system, telephone and fax line, Internet and audio system. Villa Ustra: Villa Ustra is situated in the Beli Brezi resort in the mountain area 30-35 km away from the town of Kardjali and 7 km away from Ardino. The villa can meet up to 16 people. There are 3 apartments with 2 rooms in each. The rooms can be double or twin room. Also there is a room for 3 people. Each apartment has separate bathroom, hot water and heating. There is a summer barbeque and a parking lot. On the second floor of the villa there is a big living room with a fireplace, satellite and modern kitchen furniture. There is also a sauna.